Warmer weather’s return on Tuesday also marked the return of Lakeview’s evening robbery problem. 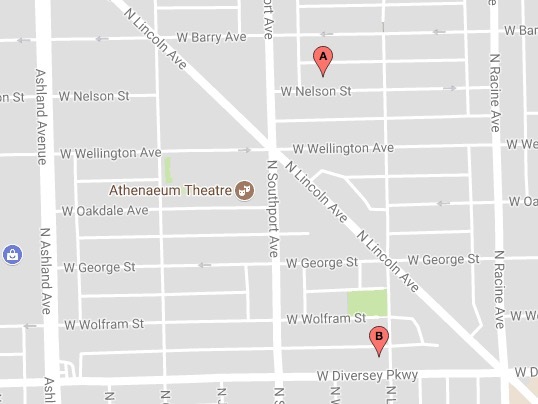 Two Lakeview residents were mugged as they entered their apartments between 7:15 p.m. and 10:15 p.m., police said. No one is in custody. CWBChicago's hyperlocal reporting can only continue with your support — for as little as $4.08 per month. The first victim was robbed at gunpoint by two men as he entered his apartment in the 1300 block of West Nelson shortly after 7 o’clock. The offenders had been walking behind the victim before they circled back and produced a handgun at his front door. Police said the offenders are two tall black men. One wore a white or gray vest with a black coat underneath, and the other wore all black. They were last seen heading eastbound on Nelson with the victim’s phone, wallet, and large blue backpack. Then, shortly after 10 p.m., a woman was attacked in front of her apartment in the 2800 block of North Lakewood. The victim said “multiple” white or Hispanic men knocked her down and took her purse before they jumped into a dark sedan that was waiting nearby. The primary offender was wearing a dark hoodie. Yesterday’s hold-ups ended a five-day robbery hiatus for the area. 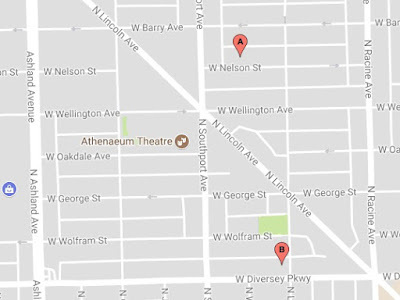 A concentrated area of southeast Lakeview and northeast Lincoln Park recorded three robberies in the first four days of the new year. No one has been arrested in those cases, either.